all tasks automatically flow from one decision-maker to the next. external users in your workflows. Manage seamless, cross-company workflows with digital stamps, task notifications e.g. for decision-makers, data entry, deadlines, or approvals. You can use digital highlighters, redact and black-out, use „post-its“ or even jot down handwritten notes using your touchscreen. Just click on terms and values to capture data – quicker than copy and paste! Data to and from external Apps via SQL. Automatically merge all documents and keep on top of deadlines. Comply with your internal or industry regulations and audit proof your processes. Easily create efficient purchasing processes that can be viewed at any time. Find all of your customer files in the same place and give yourself the cutting edge. Automate personnel files and manage job applications efficiently. Manage secure and encrypted documents relevant to your company. Take care of your contracts, leases and other related documents on-time. Always have access to an up-to-date product, order or project file at any time. Define your own company rules based on the tags and data contained in your documents and map your business processes both in your teams and across your company. New tasks will appear in lists, alongside notifications regarding decisions or changes. 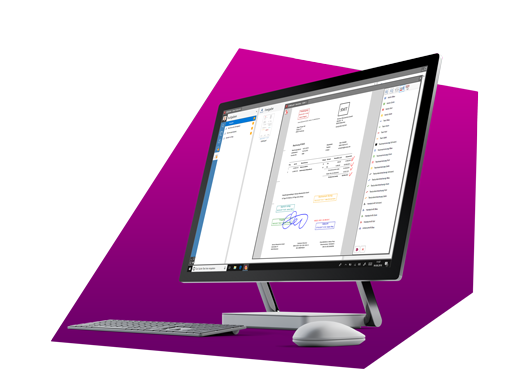 Keep up to speed with your digital workflows at your desk or on the move. Export/send files via email or export them in the format of your choice, e.g. CSV, XML, etc. 3rd party solutions for Salesforce, Sage 100, DATEV, Navision, eGecko and many more. Two-way communication with external service via URL call-ups. Use the RESTful API to connect to other software or integrate other apps. Define your own rules for workflows instead of scripting. Design workflows with parallel processes and set parameters. Automatically recognise files with the same content, and check them. Comply with legal standards like GDPR, ISO or GoBD (German Finance Regs).